Shield Foundation is a Mumbai based nonprofit organization helping elderly citizens who are either neglected by their family members or are trapped in poverty. The senior citizens are provided basic medical, legal, recreational and nutritional services for a better living. The Foundation extends its support to women who are victims of domestic violence. It offers vocational training to women; making them financially independent and capable enough to live a life with dignity and respect. Through its workshops, Shield Foundation sensitizes the growing young population towards the rising issues faced by the senior citizens in our society. In a short span of time (inception in FY10), the organization has progressed at an increasingly rapid pace. The number of beneficiaries directly helped increased from a single digit in FY10 to 1,000+ in FY13. Its indirect impact has grown substantially –10,000+ lives in FY13 as against 254 in FY10 through community outreach programs. Shield Foundation is a registered investee with ‘UnLtd. India’; an organization backed by several financial investors encouraging social entrepreneurs. Shield Foundation received total income of Rs0.5mn in FY13. 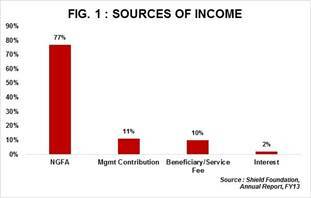 Majority of Shield’s donations (77% of total income in FY13) are received from Non Government Funding Agencies (NGFAs). These donations are received for defined and time bound projects throughout the year. Donations are sought based on number of potential beneficiaries likely to avail services from Shield Foundation in a year. As fewer women registered for vocational training in FY13, the donations received were impacted in FY13. Direct Program Expenses incurred in FY13 is less than that incurred in FY12 (Rs0.6mn in FY12 v/s Rs0.5mn in FY13); however 75% of total expenses is incurred towards project execution. 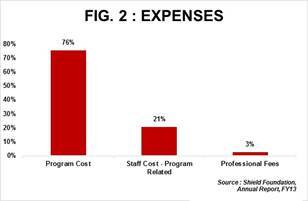 Staff cost being insignificant is clubbed with Program Expenses as there are only 3 full time employees drawing minimal salaries. The Foundation has a very small corpus of Rs0.1mn in FY13; same as FY12. Membership Fees received are set aside and added to corpus each year. Shield Foundation has received donations in kind from numerous individuals. This is an off Balance Sheet item. Donations in kind received in FY13 were to the tune of Rs0.1mn which include sponsoring medical and nutritional expenses for seniors. Increasing financial support from existing donors and induction of new donors to the list of existing donors is noteworthy; however these donations are inadequate for meeting the organization’s current needs. Despite the donations received from external sources; funds are infused by the Founder Trustee annually to make up for shortages. As the organization is growing, the Foundation will have to initiate fund raising activities to attract regular donations from external sources. Like any other start up, Shield Foundation is currently struggling with identifying the right long term financial supporter/partner that will help them continue offer their services. Appointing motivated lawyers to work with Shield Foundation on a case to case basis. Lawyers are generally reluctant and lackadaisical when approached for seeking assistance on cases for abandoned senior citizens. Limited or no support from area police when approached for cases pertaining to abandoned elderly citizens. Inadequate funds for non-medical & non-educational purposes; thus putting liquidity pressure on funds allocated to ‘other objects of the trust’. Limited network with donor community and government agencies; restricting the organization to ramp up their expansion plans. The Board meets quarterly to discuss new project initiatives and evaluate the performance of the projects executed. However, the Board members meet regularly (15 days a week) on an informal basis. Shield’s Board comprises of senior professionals like doctors, lawyers and experienced social workers who bring in their experiences in serving the organizational objectives.